Recently voted the top Mariachi in Texas! Come see us live every Friday at Nicha's Restaurant 5059 NW loop 410 San Antonio, TX 78229 from 7-10 pm or on YouTube. Our prices start from $250 for a serenata or $380 per hour depending on availability and location. Our repertoire consists of traditional rancheras, sones, boleros, cumbias and some fun english pieces as well. Our songlist is very diverse and always keeping up to date so we can meet any request. We are very professional and energetic and always maintaining the traditional suit looking our best for any occasion. We are very dependable and willing to work with our clients (link hidden)ra informacion en espanol hable al numero de tel. Everyone loved them. They were on time and entertained for about 30 minutes. I would hire them again even though they were kind of pricey. Thank you for making a wonderful day, more special. Hired for wedding reception. Since the beginning, I specifically asked for 8 players, and the day of only 6 showed up, and they arrived 30 minutes late. I complained about it, but he said no and that I only asked for the six. I had proof but he wanted to lie and deny it, so unprofessional. They rarely knew songs I chose. Several of them kept stopping to go use the restroom and it was taking time away from the hour I payed for. They also told me if I wanted more time, I only had to pay, obviously, so when I did ask, they said no. Overall, they played somewhat good, but I wouldn't hire them or recommend them to anyone. This is a ridiculous lie on behalf of this client. They did have many requests of which only 2 songs were not played because they weren't even traditional Mariachi songs. The agreement was only for 6 members and they wanted us to play extra time but we had another commitment to go to. The people liked our performance including the client up until I told them we could not stay because of another commitment. We will not be performing for them again or anyone with the attitude of treating us like they own us. My musicians are considered the best in the industry and I will always defend them against disrespect. 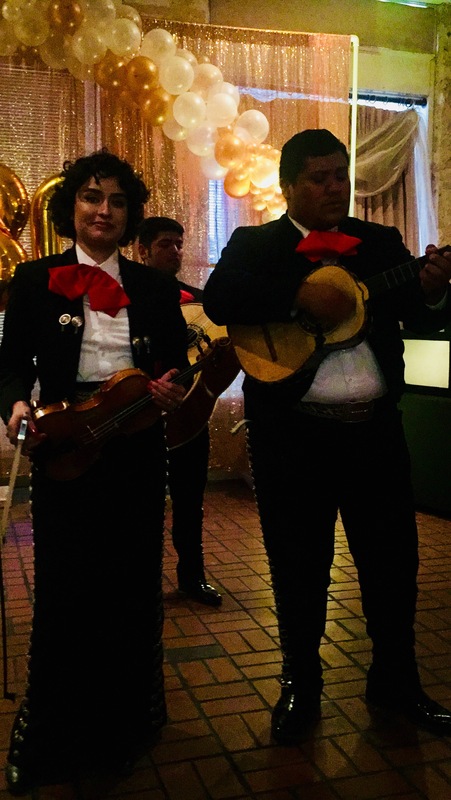 My niece went to listen to these Mariachis at a restaurant, we booked them immediately for her wedding, but a different group showed up. They had a list of songs in advance to play for the wedding reception, but the group they sent had no idea about the list or how to play those songs. Extremely disappointed! 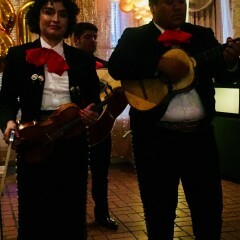 We hired Mariachi Los Conquistadores for our daughter and son in law's wedding reception held at ZaZa Gardens. The group was a big hit for our 175 guests. I sent them a list of the "must play" songs and they were very accommodating. Their music and singing was great and Carlos has a great personality and engages with the guests. Overall I recommend the group without reservation. They were a big hit, easy to get a hold of, on time and very easy to work with! Thank you! It was our pleasure and we appreciate the review!! I hired this group based on many great reviews despite a few really bad reviews. They are excellent performers and they literally made me cry because they sounded so great. But, of all the vendors I hired for my wedding, I received the least response from them. We communicated through Gig Salad and one phone call on the day of. I sent several messages leading up to my wedding that week because they hadn’t contacted me like all my other vendors had and I could tell that the messages had been “seen” but didn’t receive replies regarding whether certain requests could be fulfilled such as song selection. I guess in their mind “no news is good news” but as an anxious bride I would have appreciated more communication so that I didn’t have to call a couple of hours before my wedding to be sure they would show up. Adding to my anxiety was a review where they recently did not show up for a performance and it sounded like they didn’t even notify the client that they couldn’t make it. I called and spoke with Ashley. She called back right away but repiled with one word answers versus other vendors that initiated contact with greetings such as “Happy wedding week!”, and replied to all messages. In short, very talented group but they need to work on client contact and service. I highly recommend them !!! This group was booked and paid in advance and they were a NO SHOW! They were to play at our Official Fiesta Event! On Sunday April 29. This is true and we apologize that this happened. It is extremely unlikely. Unfortunately there was an unforseen situation that day that caused the group to miss your event. I hope you can understand that sometimes things are out of our control and we would have loved to be there. I hope you can accept our sincere apologies. Mariachi Los Conquistadores were just perfect! They did a really great job, so talented, funny definitely would hire again!!!! Thank you all!!! The entertainment was excellent. They were on time, very professional and our guests enjoyed the 4 hour performance. I would highly recommend them to all. Thank you! We had the best time!!!! I am so happy I booked them for our party. Everything went smoothly with booking through Gig Salad and they were great singers and musicians. Very happy and will book again. They moved around from table to table, everyone loved it ... and oh my if they can sing!! We will hire them again !! Great artists. Super Professional. Perfect Band. The Mariachi Los Conquistadores were perfect. I had them play right after I asked my girlfriend to marry me, and they had perfect timing, and played a beautiful song. It was great. Best Group I've ever seen! These guys were the most professional group I have ever seen despite my family's attempt to get the drunk with shots of tequila. They were entertaining were able to play all of their requests. We were blown away by their ability. (Ask for the Devil went down to Georgia.. AMAZING!) So many compliments, fantastic job! Thank you very much for your hospitality!!! It was a pleasure working together!!! We used this group for a wedding. From the beginning, the group responded to our initial inquiry quickly. They kept in contact up to the date of the event. The performance was very good and kept the party going. We had 8 mariachis, including a male and female singer. We will look to them again next time we need their services. Excellent!!!! Thank you very much! It was fun working for you guys. Thank you for such a great performance! 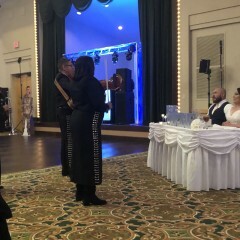 Everyone at our wedding asked where we heard about mariachi los conquistadores because they loved the music! Festival of Homiletics Conference - Exactly what we ordered! Thank you so much for adding to our week-long preaching conference with your presence and your fantastic music. You exceeded our expectations! You were on time, looked great and sounded even better. 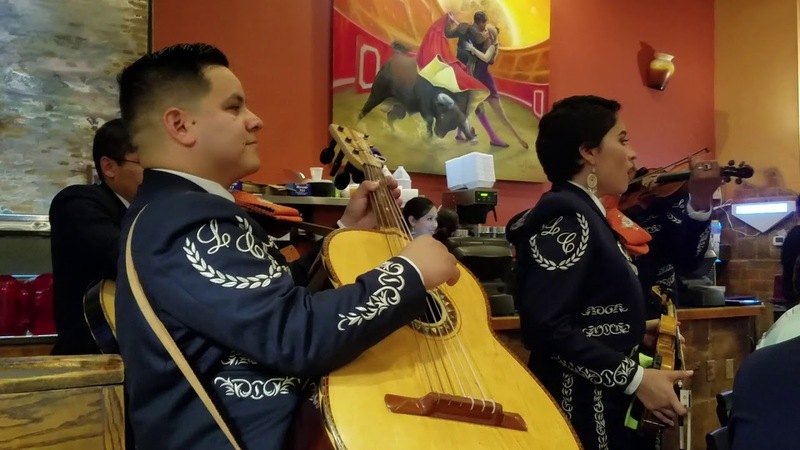 You played to the crowd with pieces they could sing-along to, as well as including ones that showcased the cultural background of Mariachi music. I couldn't have been happier - from your professionalism, to your enthusiasm to your skill as musician! Thank you, thank you, thank you from the bottom of my heart! It was our pleasure!!!! Thank you so much!!!! Thank You! We appreciate the review and can't wait to work with you again. 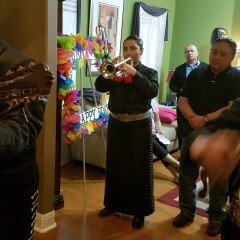 The Mariachis played for my dad's 75th birthday party and did a great job performing and keeping our guests well entertained. They were able to sing all the requested songs made by our guests. I recommend this Mariachi group for any celebration. Thank you very much! It was our pleasure!!!!! On time and great performance! Thank you very much! Our pleasure! Mariachi Los Conquistadores did an excellent job of entertaining everyone during their performance at my wife's 70th Surprise Birthday Party. Will use them again in near future and recommend them to everyone. A Big Thank You to the Mariachi group. Thank you for your review! It was our pleasure! Such a great job! Professional, arrived on time, and serenaded our guests. Thank you for being a part of our wedding day! Mariachi Los Conquistadores were a great addition to our staff Christmas party. Very friendly and talented bunch and their performance was really enjoyed by all. They did a fantastic job for my grandmother's 90th party! Everyone had a great time. Would highly recommend and Carlos was a pleasure to deal with. Thank you! It was our pleasure!!!!! The group was smaller than I anticipated, yet the gentlemen were fantastic & all enjoyed the music! Thank you it was perfect! Thank you! It was a pleasure performing for you guys! Excellent performance, everyone enjoyed them. Thanks for taking the time to comment! It was our pleasure! As soon as the group went into the party caught the attention of the attendees. The instruments performance was excellent and the voice of one of the ladies was outstanding. I would review them as excellent but the male voice was not strong enough. I have seen this group before with different singers and it was much better. Very professional in every sense, they were there on time and they knew all the songs that were asked. Very good performance. Thank you for your review! As always it is our pleasure performing for you! Thank You So Much For taking the time to write a review!!!!! It was a pleasure working with you!!!! They were great for our wedding. 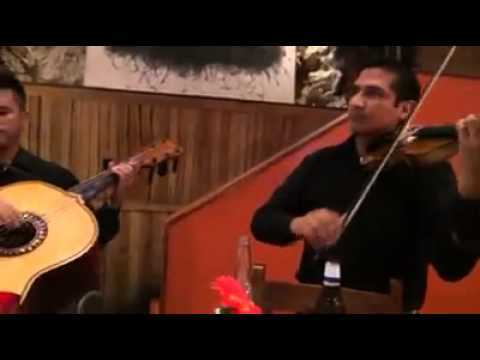 Positive reviews from our guests about Mariachi Los Conquistadores. Their preformance was outstanding. Great voices and personalities!! Thank you! It was fun performing for you guys!!!! What an awesome performance. Great job getting the diversified cried involved. Loved it all. Thank you for the Review! As always it's our pleasure!!! They were excellent. People would have requested that the young girl sing more. Beautiful voice she has. They played all the great music. Definetely would hire them again. What a great group! 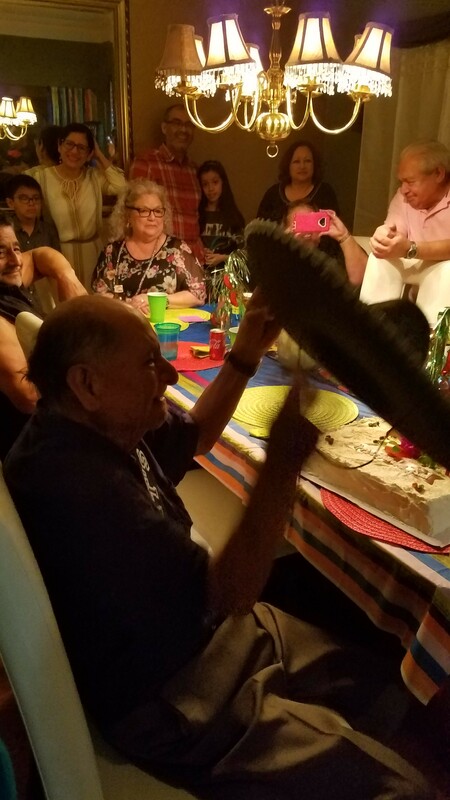 My Mom's 95th birthday and they made it super special. Arrived on time and played beautifully. Well worth the price and I would hire them again. Just great and a hearty Thank You to them. Thank you very much! As always it is our pleasure!!! 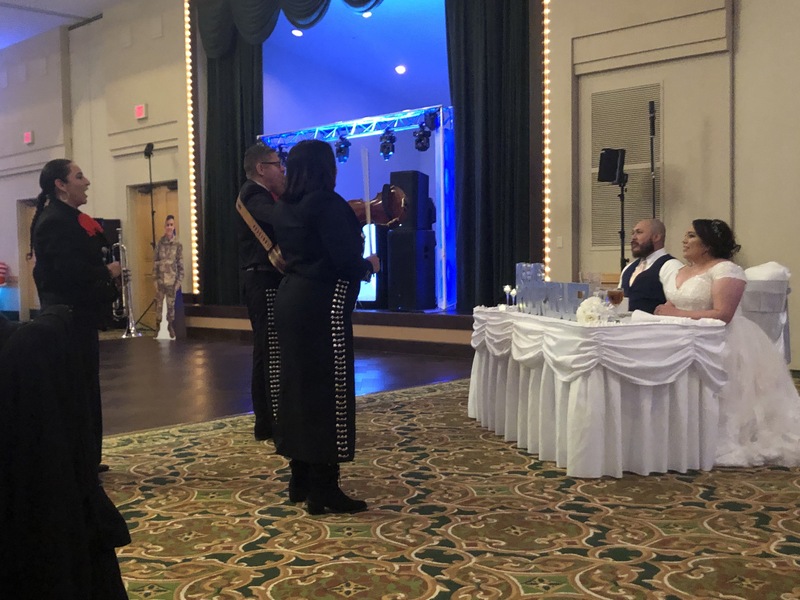 I contacted Carlos and his Conquistadores to play at my daughter's wedding reception and they were one, if not the highlight of the wedding. I resisted the temptation to micro-manage and trusted them to be professional and they exceded my expectations. They were originally going to meet us at the top of the stairs after my daughter's ceremony at Marriage Island, but they had impeccable timing and starting playing right after the vows and as they lead the marriage procession to the reception at San Fernando Cafe. As we walked through the streets of downtown San Antonio it prompted random people to cheer, whistle, honk, clap, photograph, and videotape the procession and created a sense of community as San Antonians and tourists alike expressed their congratulations to the bride and groom and appreciation for the music the mariachis were playing. Carlos so accommodating and wonderful I can not adequately express my appreciation and thank him enough. I had this group for my mothers birthday and I was completely satisfied. They played and sang excellent. They were very professional. Thank you so much. It's our pleasure! I would hire them again and again! Wonderfully entertained and talented. A great Mariachi group that keeps the crowd entertained through interaction and great music. The sound and the skill were on display in every song whether in English or Spanish. For a first rate group book this group, I definitely will. Thank You Very Much!!!!! It was our pleasure performing for you guys!!!! Contacted them to perform at our wedding months prior and agreed to a time and location. A week before the wedding Carlos Reyes has not answered nor has he responded to my e-mails or phone calls. It is unprofessional to have a lack of communication. From a person who has coordinated numerous of events I strongly recommend that this group of mariachi not be hired. I am sorry you feel that way Mr. Martinez. From a person who has been doing this for over 20 years with nothing but positive feedback. I know we can't please everyone. Once the time and location have been established on a contract we will be there. As professionals we do not require step by step instructions on how to do our performance. It is very unprofessional of you to cancel us one week before when other clients were wanting that time and date. If your intent was to harm our credibility I think my long list of satisfied clients will disagree. Thank You and God Bless. They entertained a crowd of 200+ at our 50th wedding anniversary party and were a great hit. This group is very versatile and can match their performance to the audience as needed. Highly recommended. Thank You Mr. Trzaskoma! As Always it's an honor to perform for such a fine group of people who appreciate good entertainment. Thank You!!!! We were honored to have such an amazing group of talented musicians at our 205 Missions Mega Metro. Thank You Very Much! Our Pleasure As Always!!! I gotta say this is the best Mariachi band we have heard.. Thanks for making our Graduation party a hit.. We were simply speechless.. We look forward to doing business with y'all again..
We all enjoyed your music and we all had a wonderful time especially my mom. She was overwhelmed with joy and very much surprised. Even the people at Fatso's Sports Bar enjoyed your performance. Thank you so much for everything! I would highly recommend you all! Thank you very much Mr. Gamboa! It was a pleasure performing for your Mom and your Family. Also thank you for the barbecue plates! Until the next party thank you! We hired this group for a "fiesta" style baby shower and we're very impressed. They showed up on-time and were very professional. Our guests all commented on how talented and fun they were. They were able to play any song that was requested wonderfully! They are very reasonably priced and we will definitely be using them again!! Absolutely amazing! I would definitely call them again. 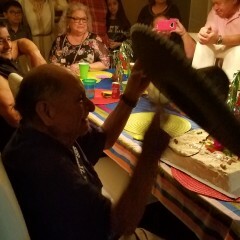 Thank you for making my daddy's 85thbirthday party a memorable one. Thank you! As always it's our pleasure! 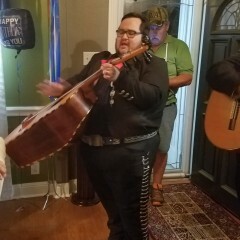 I had Mariachi Los Conquistadores at my wedding reception and they provided us with two hours of fun. The group is polite and festive. They made an already incredible day extraordinary. I will use them again and I highly recommend them. Thanks Guys! Thank you very much for the review. It was our pleasure to perform for y'all. Thank You! Love them and would use them again and again. My daughter and son in law loved them! They said that was an hour well spent because they loved them! I have contracted them for Mother's Day twice and each time they were great!!! We used these guys for our end of year appreciation party for church volunteers. They were awesome! Very professional, communicated quickly and most importantly sounded great! I plan on using them again. They were simply fabulous, charming, professional and crowd-pleasing!!! Everyone enjoyed them and extolled them!! They were awesome and played everything that was requested!! We loved them!!! Mariachi Los Congquistadores are a good group for the price. Although, most of the group arrived 15 minutes late to our event due to traffic, our audience did enjoy them. I would use them again but reiterate the importance of arriving early. Thank You for Hiring Us! It was our pleasure and Hope to perform for you guys on the next Party!!!! 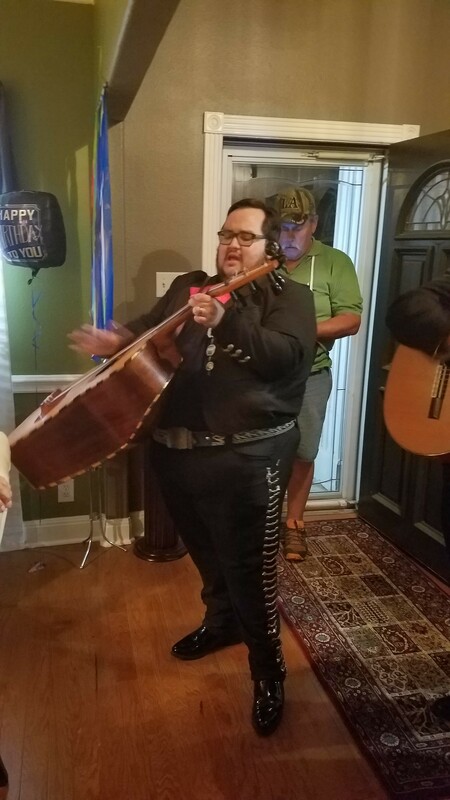 I just had theme last night at my house for Mother's Day, everybody was so happy with this Mariachis, they played every song we ask for it. 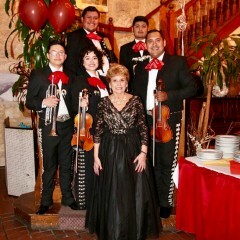 I already hired theme for 3 events 2 in Aug. 1 in Sept.
Best Mariachi Band in San Antonio!!! I hire them for my brother's wedding!! This is one of the best mariachi bands I have heard in a long time.Excellent singers!! Very proffecional, full of energy and awsome interaction with the crowd. There performance was excellent knew all the songs guests requested. I highly recommend Mariachi Los Conquistadores!! I have hired several Mariachis in San Antonio Tx. but when we heard Mariachi Los Conquistadores at the Riverwalk I thought I was in Mexico Best Mariachi in South Texas, very professional and talent. I've had Mariachi Los Conquistadores play for 2 personal events and for my mom on Mothers Day for the last 3 years. They have incredible talent, and are very entertaining. Mariachi Los Conquistadores was an amazing group. There where full of energy and really got the party going!!! I was very impressed and I felt like I was 15. I had so much energy that Mariachi Los Conquistadores made my night. They really helped me celebrate my birthday with a bang. I would hire Mariachi Los Conquistadores for all of my parties or any occasion. We provide entertainment for any occasion. We keep it very fun and energetic with a variety of singers. Our singers have won many vocal competitions state wide and have been recorded and featured in many televised events. We have female and males vocalists who sing solo, duets, trios, and full group chorus. We have many fun pieces in which we get the audience involved and include dancing and singalong. 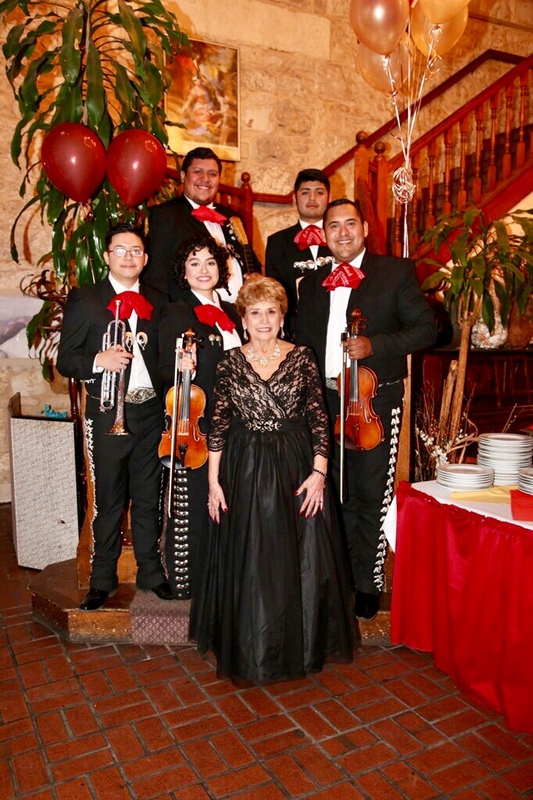 We feature many of our singers in the most traditional Mexican Mariachi music as well as some English classics. We also include many instrumental pieces to feature our top instrumentalists in impressive classical and popular melodies. We can also provide shows with a full sound system "concert style". When you hire us you can always expect the best with no hassles. 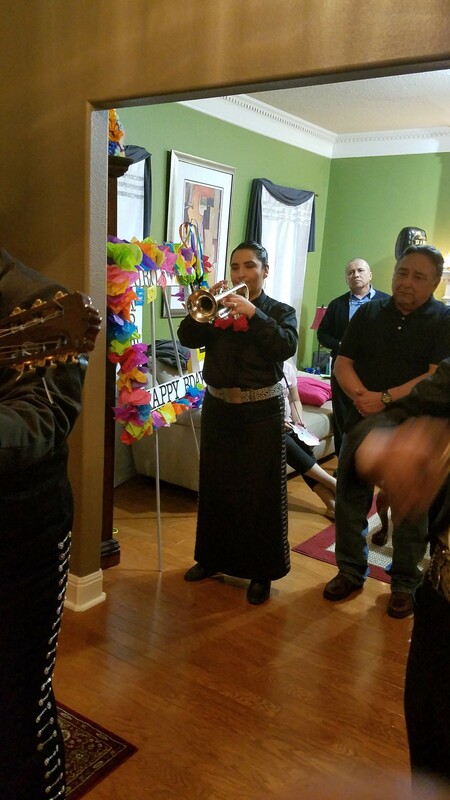 We are Mariachi Los Conquistadores, our more experienced members have played and recorded with all of the top Mariachis in San Antonio and most of the Tejano Artists here in Texas. Most of our members grew up playing mariachi music since a very early age. Most of our older members have taught Mariachi at several local schools, universities, and private academies. Our director has had the privilege of writing arrangements and guest directing several local Mariachi Groups and orchestras in San Antonio, Dallas, and Houston. Throughout our experience we have come across some of the most talented young musicians all over the city and brought them all together in this group. When you hire our group you can expect to get the top young talents San Antonio has to offer. Our musicality is very diverse and overall fun and entertaining. We strive to advance constantly by holding regular rehearsals in order to keep up with any request. We run a very disciplined organization therefore you can expect to get timeliness, great looking and matching outfits, and the best sounding musical entertainment experience. We hold great pride in our music and tradition so I know that we have a great future and would like to be part of your business and celebrations. We are mainly an acoustic group who perform standing or strolling from section to section. However, if a sound system is desired we also have a full PA system the only requirement would be space and electric outlets. note: if a sound system is desired the price will vary depending on the event type. Our song list can be provided upon request. We include all the most traditional songs that the people have requested over the generations. We also keep up with the newer songs that are coming out. If there is a special request we will include it in our show as long as we are given notice at least a week before the event. Our group is very diverse but we always have looked up to the best Mariachi Groups in the world like Mariachi Vargas, Mariachi Nuevo Tecalitlan, Mariachi Sol de Mexico, and Mariachi Los Camperos. I have had a chance to play along side these groups in many venues all over the US and Mexico and hope that my group members will someday do the same.